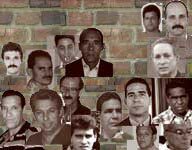 Today and on each of the next 113 days I'm going to try to honor these brave Cubans by sharing their names and little about their respective stories. Ever since I started this blog, I have felt it vital to remember their names, names the regime would rather have the world never know. That is the only way to fully grasp the injustices they are suffering. Today's prisoner is Marcelino Abreu Bonora. I have written about Abreu, a veteran of the Castro gulag, several times before, whether it's documenting how he was arrested and sent to prison or how he continued his fight against the Castro dictatorship by going on hunger strike. Abreu was arrested Aug. 13, 2012 -- Fidel Castro's birthday -- after the police caught him distributing anti-government leaflets and shouting anti-Castro slogans. It wasn't until more than a year later, on Aug. 29, 2013, that Abreu was tried, convicted of bogus charges of "public disorder" and "disrespecting" Fidel Castro -- as if he deserves more than disrespect -- and sentenced to 4 years in prison.